Time and relationships, including the one with yourself, are two of your most precious commodities. Treat them right, by practicing saying "No" when you mean it. Women are programmed to say yes. As women, we tend to want to do it all. We are biologically designed to be caretakers. We’re taught to be “good girls” and that means taking care of people even at your own expense. We are told that it’s selfish to put your needs first. Saying "no" can be hard. It’s not necessarily natural for you to say "No" and that’s ok. It can feel bad, because we’ve been told it’s selfish, but that couldn’t be further from the truth. We can and must retrain our brains to say no. Knowing when to say "No" because it’s out of alignment with your integrity is the opposite of selfish. It’s actually one of the most loving things you can do. Being able to say “No” is absolutely ok and a necessary part of healthy relationships and your ability to be fully in your life with authenticity. Not saying "No" can have major consequences. You probably don’t think about it like this but I want you to understand what’s truly at stake here. Throughout the years I've been in my profession, I have found that the inability to say "No" can cause serious consequences such as marrying someone you don’t want to because you feel pressured, getting physically ill, fatigue-related car accidents, becoming a doctor or attorney to please your parents when you wanted to be an actor, depression, anxiety, dysfunctional/ abusive relationships, drug and alcohol abuse, a complete loss Self, and much much more. Can you see how it’s not loving or honorable to people please? When you say yes to something that you don’t want to do, it’s generally because you want to be liked, make someone happy with you, or not rock the boat. This is not loving though, this is manipulation. They are either going to like you or not. If they don’t like you because you are being honest and saying "No," they are not your people. Knowing this ahead of time can save everyone involved a lot of grief. How to know when to say "No"
Say "No" when you don’t want to do something. Period. Take a couple deep breaths and check-in with yourself. You will know when it’s a "No." Like your reason for saying "No." Ask, yourself, “What’s the most loving thing to do for me and for the other person?” Go with that. In the beginning, you can practice these statements, as is appropriate to your situation, to retrain your brain. You’ll soon find yourself a pro at "NO," and be flooded with your own “No” statements. There’s no need to lie, you can be truthful. And being truthful doesn’t mean you owe anyone all of the details. Details usually aren’t appropriate. Honest, straight forward and assertive. Polite but firm, end of story. Polite and confident. Let there be silence after this one. Staying accountable, being focused and sticking to your word. 10. I don’t have time right now, but let me recommend someone else I know who might be able to help, she’s fab! Your turn to practice! Get cracking. If you need help, I’ll jump on a call with you! I've got your back. 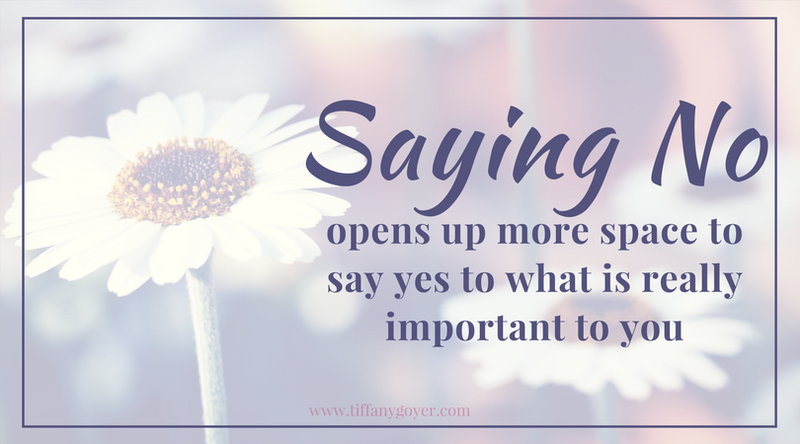 Saying "No" will open up more time and space to say "Yes" to what is really important to you. You’ll see. :) Lots of love. Newer PostSex & The City vs. Fear & Anger?